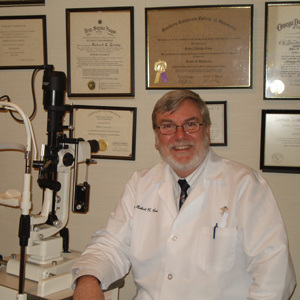 Our Practice - Robert C. Crowe, O.D., F.A.A.O., Inc.
Dr. Crowe graduated, with honors, from the Southern California College of Optometry in 1976 with a degree in Optometry. He is a Fellow of the American Academy of Optometry and a Diplomate in the Section on Cornea and Contact Lenses of the AAO. ​Dr. Crowe is also licensed to use Therapeutic Pharmaceutical Agents in the Treatment and Management of Ocular Disease, and co-manages cataract surgery and refractive eye laser surgery. Dr. Crowe has been in private practice in Morgan Hill since 1977.